Choose Customers → Customer Center. The Customer Center window appears. Click the New Customer & Job button and then click New Customer. QuickBooks displays the Address Info tab of the New Customer window. Use this window to describe the customer in as much detail as possible. If you click the New Customer & Job button and choose the Add Multiple Customers: Jobs command, QuickBooks displays a worksheet you can use to describe multiple customers at a time. Enter the name of the customer as you want it to appear in the Customer list. Note that this is the name that you use to refer to the customer within QuickBooks, so you can abbreviate or shorten the name if you want. If IBM Corporation is your customer, for example, you might enter only “IBM” into the Customer Name text box. Specify the total of the customer’s unpaid invoices by using the Opening Balance text box. Move the cursor to the Opening Balance text box and type the total amount owed by the customer on the conversion date. 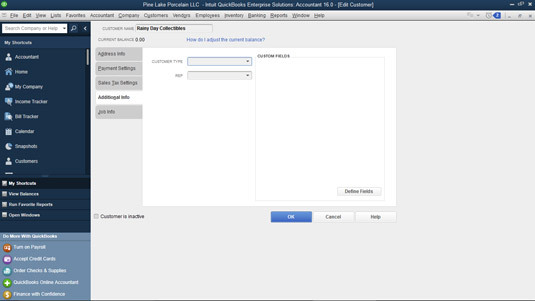 QuickBooks suggests that you not enter a balance in the Opening Balance box as part of setting up QuickBooks. (If you’re interested in the logic of QuickBooks’ argument, you can view the Customer’s online tutorial, which is available by choosing Help → Learning Center Tutorials, and then click the Add the People You Do Business With link.) However, you want to enter the customer’s unpaid balance into the Opening Balance box. 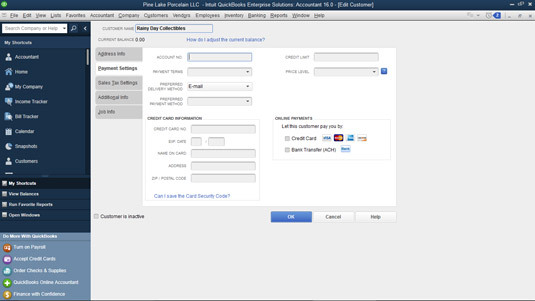 Doing this makes setting up QuickBooks correctly much easier. Enter the current date in the As Of text box. Enter the full company name into the Company Name text box. (Optional) Enter the name of your contact, along with other pertinent information. Move the cursor to the Full Name text boxes and enter the customer contact person’s first name, middle initial, and last name. You can also enter the contact’s official position using the Job Title text box. Provide telephone, fax, and email contact details. Go ahead and fill in the telephone number, fax, website, and email text boxes. You can use the Invoice/Bill To text box to provide the customer’s billing address. QuickBooks copies the Company and Contact names to the first lines of the billing address, so you need to enter only the address. To move from the end of one line to the start of the next, press Enter. You can use the Ship To text box to provide the customer’s shipping address. Click the Copy button to copy the billing address to the Ship To field. If the shipping address differs from the Bill To address, simply open the Ship To drop-down list, click Add New, and then enter the shipping address information the same way that you enter the Bill To address. You can add multiple shipping addresses. After you add a shipping address for a customer, you can select the shipping address from the Ship To drop-down list. (Optional) Click the Payment Settings tab and record more data. You can use the boxes on the Payment Settings tab to record bits of customer information, such as the account number that should be included with any payments. You can also record payment-related information such as the customer’s credit limit and credit card information. (Optional) Click the Sales Tax Settings tab and specify the customer’s sales tax rate. You can use the boxes on the Sales Tax Setting tab to store the appropriate sales tax item and rate — and to record the customer’s resale certificate number, if that’s needed, because sometimes you sell items to a customer that aren’t subject to sales tax. (Optional) Click the Additional Info tab and record more data. Add more details on the Additional Info tab. 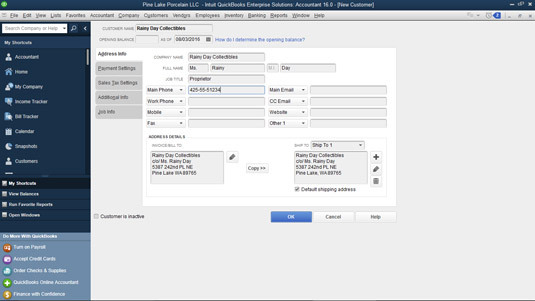 You can also use the Additional Info tab to record the sales representative assigned to a customer. You can also click the Define Fields button to display dialog boxes you use to create fields for collecting your own customized bits of additional information. (Optional) Click the Job Info tab to add specific job information. You can add a specific job to the new customer’s information. Save the customer information by clicking OK. When you finish describing a customer, you can save it by clicking OK to add the customer to the list and return to the Customer Center window. If you want to change some bit of customer information, display the Customer Center window, double-click the customer name in which you want to change information, and then make changes in the Edit Customer window.